Wanderlust: a strong desire to travel. As a young man, he sailed pass a quaint little island paradise in the southern Caribbean waters of Belize. What he stumbled upon was truly a dream come true. Met by forever smiling, warm and friendly staff he was generously welcomed and fed. He was hooked. The views from every angle of this little hidden treasure were unbelievable. He vowed to return soon. And he would return to marry the love of his life at his most favorite place in these Caribbean waters. Coco Plum Island Resort, one of the highest rated Belize all inclusive resorts, is a great destination for honeymooners, lovers, and even friends looking for a secluded getaway. Coco Plum also offers its couples the opportunity to get married on local soil. Whether the couple comes alone or does an entire private island rental to share with friends or family, our weddings are a spectacular display of artistry and love. Leave all the planning to a wedding planner, who coordinates the day, leaving all the days leading up to the ceremony to the enjoyment of the lovebirds. Our lovely couple and their family surely did enjoy each day leading up to their ceremony as they relished in our local creations of our skilled bartenders and chefs. Between swimming, paddle boarding, a little karaoke and diving there was still just enough to time to lay back in a beach chair to enjoy our famous Mosquito Bites. The wedding day quickly draws near, and the anticipation builds. The island grounds men have been working arduously to prepare the spots for the ceremony, cocktail and reception area. The wedding planner makes all the final touches – floating candles, tiki torches, a lit pathway to the ceremonial spot, floral centerpieces, and of course putting the champagne on ice – as the bride and groom each get ready in their cabanas. The ceremony begins and then ends ends just with the sun fading away in the background. A toast is made as the crowd cheers to the union: fireworks complete this breathtaking scene. At twilight, the cocktail is held and the toasts continue. The groom plays a surprise video for his bride – a video declaring his love and dedication and appreciation of her. The unwavering kitchen staff continues to produce one wonderful course after another for the reception buffet. By the last tray of food, a line has formed and the party sits down to enjoy their meal. The band plays light music during this time, but are steadily preparing for the party that will occur soon after. Shoes come off, skirts get hiked up a little and the dancing in the sand begins and continues thru the night. And another wedding to remember is completed. The young man’s dream has become a reality ten times over. Your dream can come true – come have your own private island wedding leaving all the work to the professionals. Congratulations Javier & Christina! 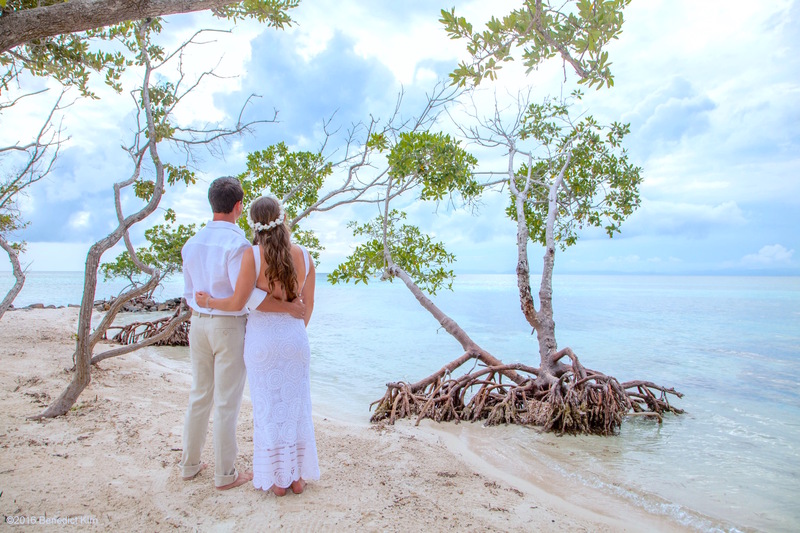 It was a pleasure hosting your Belize destination wedding at Coco Plum Island Resort. Book our wedding package and enjoy your vacation, wedding and then your honeymoon all in the same week. Enjoy the views, the meals, the unlimited local drinks, inland tours and marine tours with the person you love at our amazing private island paradise.